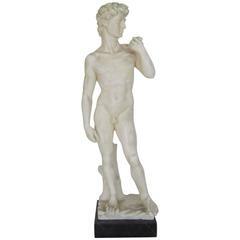 A classical male bust sculpture piece on a black base. Excellent condition. Piece measures: 3.25 in. W x 3 in. D x 8 in. H.
Piece and base are made of resin or similar/like material. Well executed French terra cotta bust sculpture of a classical Roman male, circa 1920. Signed and dated “L. Majoli f. Roma 1869”. Large vintage French patinated plaster bust sculpture of Hermes on a wood base. 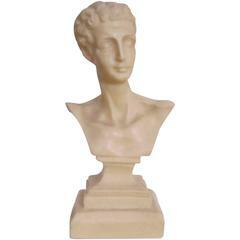 This well executed classical Greek style bust has the most handsome face and dates to the 1930s.